§ The factors that are related to the regulations: The regulations and the policies of the governments are directly affecting the decisions of the companies. These factors may increase or decrease both the opportunities and threatens for the company. § Market conditions and customer behaviors: The people who are taking decisions or making strategic analyses may go through a close environmental analysis regarding the market activities and the customer requirements. In these analyses the analyst may face with the changes in customers’ needs which results after a change in population pyramid or income distribution or in changes in the life cycle situation of the products and where their new location in this cycle. § The factors related to the suppliers or the suppliers market: The companies must provide sufficient resources in order to serve better to their customers. These resources might be the raw materials, semi-products or products or the human resources. This analysis will show the dependence of the company to its suppliers. The market of the suppliers might be a free market or controlled by one or a couple of suppliers. This will increase or decrease the bargaining power of the company. § The factors related to the financial institutions: It is clear that the companies do not only have relations with the suppliers or the customers. They may have relations with the financial institutions such as banks, leasing companies etc. These relations may be short, medium or long term depending on the financial need and the eligibility of the customer. These companies may need short term cash finances where they may need long term non- cash finances such as letter of credit or letter of guarantee transactions. Due to these reasons when the banks change the conditions for finance these may have positive or negative impacts to the company activities. If the company is a big enough one, the bargaining power will be more than the smaller ones. § Relations with labor unions: The labor union organizations have great impact on the activities of the companies. They may convince the work force to strike and stop working for the company. Nevertheless, if their needs are satisfied the work force will work more effectively. The above mentioned environmental analysis shows that how the outside factors affect the activities of the company. For this analysis the most famous model designed is the competition analysis which can be also named as Porter’s 5 Forces Analyses. Michael Eugene Porter is an American academician focused on management and economics. He has made important contributions to strategic management and strategy theory, Porter's main academic objectives focus on how a firm or a region can build a competitive advantage and develop competitive strategy. 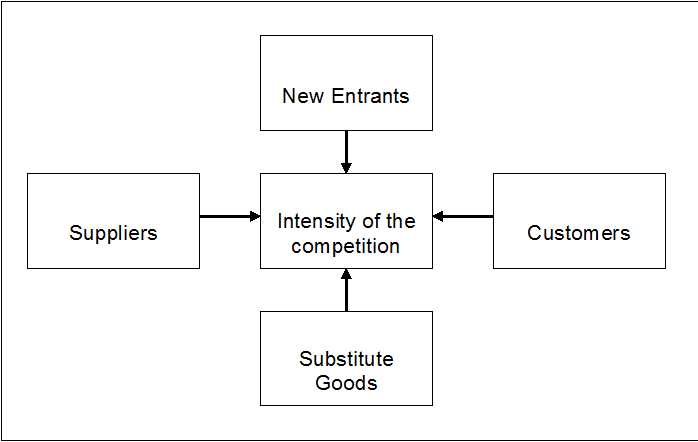 Before we go through Porter’s competition analysis, we must define what the competition is. The competition is defined as “the race takes place in product or service markets between the institutions, that helps the companies to take free economic decisions” Therefore in order to be competitive in the market the companies must be eligible enough to compete against the others. As we have seen from the above statements the magnitude of the first four factors are affecting the last factors magnitude. It is seen that before the company takes a strategic decision about the activities of the company the managers must analyze the close environment. This analysis gives an opportunity to see what the magnitude of the competition take place and who the main competitors are. According to the above mentioned statements, it is clear that this analysis must not be done only for the customers, competitors and the market activities but also the financial institutions and the labor unions must be covered. Therefore the managers will most probably understand and project the reactions of the close environment after the company takes decisions. 4054 numbered The Turkish Republic’s Act of Competition, Article 3. Before focusing to PEST that is also known as far environmental analyses, we must define the environment in business administration. The environment term is used for the items or the actors that are out of the company. These outside factors sometimes give opportunities to the company but also create negativities in company activities. · Since the environmental changes are happened rapidly the managers try to analyze theses happenings systematically. Due to these changes sometimes the company has the opportunities to grow but sometimes to shrink. · The companies that are making these systematic analyses are more effective than the others that are not paying attentions to these analyses. · The managers of companies that are not making these analyses will be forced to give reactive decisions that are not accepted to be logical in the recent business environment. Political: Political factors include government regulations and legal issues and define both formal and informal rules under which the firm must operate. Social: Social factors include the demographic and cultural aspects of the external macro environment. These factors affect customer needs and the size of potential markets. Technological: Technological factors can lower barriers to entry, reduce minimum efficient production levels, and influence outsourcing decisions. Besides the above happenings, the pace of these happenings will be also important in the activities of the companies. To explain the importance of this there is a very famous story of a frog. A frog was put in warm water. It couldn’t understand that the bowl has been heated slowly. It relaxed, didn’t understand the negativity on itself. After a while the frog lost its consciousness and the bowl started to boil. And the frog died. This a very good tale for showing what is waiting for the companies that are not reacting efficiently and analyzing the market activities very well. · Fast change: The change can be seen from the majority of the people and the companies. For example the consumer needs, legal regulations and political issues are changing very fast. Since the public is aware of these changes the effects of these are limited. · Slow change: The minority of the public understands the changes in the market. These changes are very dangerous for the public since most of them suppose that the previous terms are also applicable in the recent periods. The frog tale is the example of this. Bugünkü yazımda daha çok Bankaların gelecek dönemdeki ilgi alanlarına değinmeyi tercih ettim. Bu nereden aklına geldi derseniz, bu hafta Efma ile Infosys Finacle tarafından 47 ülkeden 108 katılımcı ile yapılan anketin sonuçlarına göre hazırlanan “Bireysel Bankacılıkta İnovasyon-2014” başlıklı araştırma elime geçti. Açıkçası raporda yer alan bazı sonuçlar oldukça ilgi çekici. Ben de bundan hareketle sizler ile ilgili raporu değerlendirelim istedim. Öncelikle 2009 yılına göre 2014 yılında bankaların çok daha fazla inovasyona yatırım yaptıkları ve stratejilerinde inovasyonun çok daha fazla yer edinmeye başladığı anlaşılmaktadır. 2009 yılında bankaların sadece %13’ü inovasyona yaptıkları yatırımı arttırırken bu oran 2014 yılında %84 olmuş. 2009 yılında Bankaların %37’sinin bir inovasyon stratejisi varken bu oran şimdilerde %61’e çıkmış. Günümüz dünyasında bankaların yeniliğe nasıl baktıklarını çok net gösteren bir tablo, değil mi? Bankaların arasında inovasyon temaları içinde mobil odaklı geliştirmeler %83 ile başı çekerken, bunu big data %67, sosyal medya %63 ve oyunsallaştırma %31 ile takip etmektedir. Bunlardan belki mobiliteyi veya sosyal medyayı tahmin etmek zor olmayabilir ama özellikle big data ve oyunsallaştırma noktasında halen bankalarımızın alacağı yol olduğuna inanıyorum. Özellikle kurumsal bir anlayışa sahip Türk Bankacılık sektörünün oyunsallaştırmayı kabullenmesi bakalım ne kadar sürecek? Bankaların tehdit olarak algıladığı kurumlar arasında artık bankalar eskisi kadar yer almıyorlar. Bankacılar tehdidi bankacılık piyasasından değil başka sektörlerden özellikle teknoloji şirketleri, telekomünikasyon işletmeleri ve start-uplardan geleceğini düşünüyorlar. Bunda da haksız sayılmazlar. Özellikle Apple, Samsung ve Google gibi firmaların gittikçe gündeme gelen sosyal ve finansal çözümleri ileride bu konuların daha fazla tartışılmasına sebep oluyor. Bu ortamda da bankaların yaşatmak istedikleri deneyimlerde de olgunlaşma görülüyor. Örneğin bankaların %80’i müşterilerinin kanallar arasında benzer bir deneyim yaşamasına gayret edeceklerini ifade ediyorlar. %70’i ise self servis araçların daha fazla kullanılmasını isteyecek gibi görünüyor. Bankalar ankete verdikleri cevaplara göre ya inovasyon lideri ya da inovatörün en hızlı takipçisi olmak istediklerini belirtiyorlar. Bankaların neredeyse yarısı (%49) inovasyonda lider olmak istediklerini, %38’i ise hızlı bir takipçi olmak istediklerini belirtiyorlar. Sadece %11’i birileri bir şey yapsın biz bir ara ilgileniriz diyor (%11). Geri kalan %2 ise ne yapmak istediğinden emin değil.